The main objective of the Cloud-Bricks platform is the creation of virtual servers, editing resources (memory, storage, CPU, network), and installing the operating system. This manual shows the procedure for creating a virtual machine. 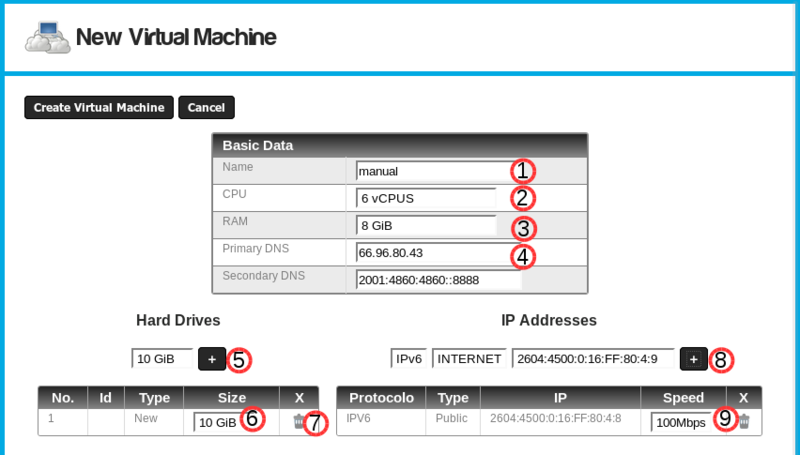 Click on the New virtual machine... button, put here the basic data for the new virtual machine. Each Cloud-Brick has 32 physical CPU cores. You can assign more vCPUs of physically exist, but this is not recommended because you may experience performance problems. RAM: Assign the amount physical memory to the virtual machine. Each Cloud-Brick has 128GB of physical memory available for your virtual machines. DNS: Change the DNS of the machine. They should be altered only in specific cases, such as virtual machines that are part of a Windows domain. A virtual machine requires at least one hard disk. Try to keep the size as small as possible disks, so cloning processes, migration, snapshots, backups, etc. will be faster and efficient. The system supports only increase the size of the disks, is not possible to reduce. Increase size of disks created. Erase Disk created. As this is a new virtual machine without an operating system, erase disks have no risk. See the explanation of the different types of IP addresses. See also documentation about VLANS. Change the speed limit of a network card. Click on the button Create Virtual Machine. Already it created the virtual machine and has been allocated the requested resources. Now the system displays the screen to install the operating system. Swap space or SWAP is a space on the hard disk of the machine, used to store data processes not remain in physical memory or RAM. Operating systems automatically manage this disk space according to the amount of RAM available. Unix systems use a special partition called SWAP, while Windows systems use a file called pagefile.sys. Cloud-Bricks automatically assigns a swap partition the virtual machine. When the RAM is less than 4GB SWAP partition will be the same size as the RAM, otherwise the partition will be 4GB.